Website designers (myself included) will sometimes tell you that they despise Internet Explorer. They find it extremely difficult to make their shiny new websites look and work right in IE. They’ll point out that everything looks right in Firefox or Chrome. Must we really go the extra mile to accommodate older, non-conforming Web browsers? Here is what I recently found one large “cutting-edge” design firm doing for their non-profit client (I have altered the image below to protect the client). Instead of building their website so it would work in “older” versions of Internet Explorer (version 8 and older), they set a popup to initially obscure each and every page for unlucky IE 8 visitors. It helpfully(?) announces the visitor is using an outdated browser, and suggests ways they could be less stupid. Of course they do not explicitly accuse the visitor of being stupid, but isn’t that what many visitors will infer? For years now, they have had very little trouble surfing the Internet with IE8, and suddenly they stumble upon this site that tells them they are doing something wrong. You cannot – as a web developer – rely ONLY on statistics. Statistics can be misleading. Note: W3Schools is a website for people with an interest for web technologies. These people are more interested in using alternative browsers than the average user. The average user tends to use the browser that comes preinstalled with their computer, and do not seek out other browser alternatives. 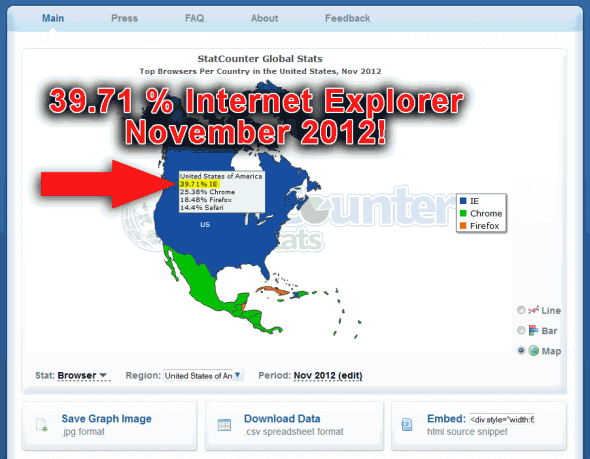 So, only 16% of techies currently use Internet Explorer! If you drill down a little more at W3Schools, you discover that the current breakdown of that 16% is 7.6% using IE8 and 6.8% using IE9. Of the techies who visit the non-profit website represented above, only 7.6% are going to experience the annoying popups. That’s not so bad. But wait! Did the non-profit organization engage the design firm to create a website for techies? NO! Their target visitors are “normal” people with above-average compassion and philanthropic leanings. Their goal is to get donations, not to impress the visitor with bleeding edge technology. Let’s assume that the IE8/IE9 breakdown is similar to what we see at W3Shools…. Somewhere over 20% of American visitors (read wealthy American visitors with disposable income!) will view the non-profit’s site with IE8. One in five of their visitors will have a miserable experience when they visit the site. Will they make a donation? I doubt it. A few years back, I designed a new website for my church: www.redeemerbiblechurch.org. The site was not looking right in an old version of Internet Explorer (probably version 6 at that time). I expressed my concern to Daniel Ice, a fellow church member and seasoned coding expert. Daniel suggested this principle that has guided me since: “Don’t worry about accommodating visitors whose browsers are so old that they are accustomed to a miserable experience on the Internet.” What I have been suggesting in this post is a corollary to Daniel’s advice: “DO worry about accommodating visitors whose browsers are new enough that their Internet browsing experience is generally good.” This is essential if you are enhancing a client’s reputation, and not just your own.